Home > Latest News > Does it contain chilli? Why does chilli cause reactions in some people? This is due to a natural chemical called ‘capsaicinoids’ present in chillies. Capsaicin gives chilli peppers their heat and is present in almost every pepper. They’re found primarily in a pepper’s ribs and seeds, making them hotter than the rest of the pepper. You can reduce the amount of heat by removing a pepper’s ribs and seeds. Capsaicin has no flavour or odour, but act directly on the pain receptors in the mouth and throat. This is produced by peppers as a defense mechanism against certain mammals and fungi. It’s an irritant for most mammals, including humans, as it produces a sensation of burning on any tissue that it encounters. While chilli is considered nutritious and beneficial for our health, it can cause adverse reactions when treated as an allergen by our body. For people who have an allergy to chilli, their immune system fails to recognize the capsaicinoids and treats this chemical as a threat to the body. Our immune system creates antibodies, a specific protein which is then used to combat the capsaicin and the symptoms that cause pain and discomfort. 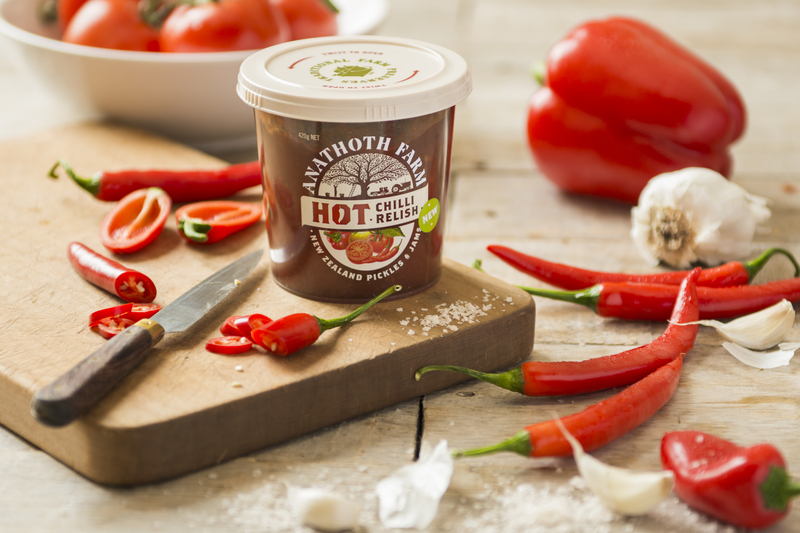 Anathoth Farm uses chilli in many of our relishes and chutneys as a natural flavour enhancer. We’ve heard from some of our customers who are sensitive or allergic to chilli, so as a result we’ve created a generic list of our popular products found in your local supermarket that contain chilli. It is important to note that cayenne pepper is a form of chilli (often referred to as ‘spice’) as with curry powder, which also contains chilli. If the product being asked is not listed and you have concerns, please let us know. How are chilli reactions treated? A relatively mild reaction, such as a burning mouth, can be relieved by drinking milk. The chilli chemical doesn’t dissolve in water, but it does dissolve in fats like milk, yoghurt or ice-cream. It’s the casein in dairy products that combats the effects of chilli. A severe reaction to chilli is not common. However, if it happens you should seek immediate medical advice.